The summer of 5776 was an incredibly successful one for RSY-Netzer. We had over 1000 participants across all of our summer events, spanning Israel Tour, Garanim (Day Camp), Shemesh (our residential summer camps), Karmiel Kaytana (day camp in Israel), URJ Camp George (a Canadian summer camp) and Mega Chalutz (our Limmud-style event for leaders). Mega Chalutz kicked off our summer in the UK with over 250 leaders and Reform Zionist educators coming together in Llangranog (our tiny Welsh home from home) for education, discussion and lively debate about our Zionist values across the movement. Our chanichim (participants) then joined the summer of fun on Garanim and Shemesh, where chanichim from 23 reform communities across the UK had the best summer of their lives (so far)! 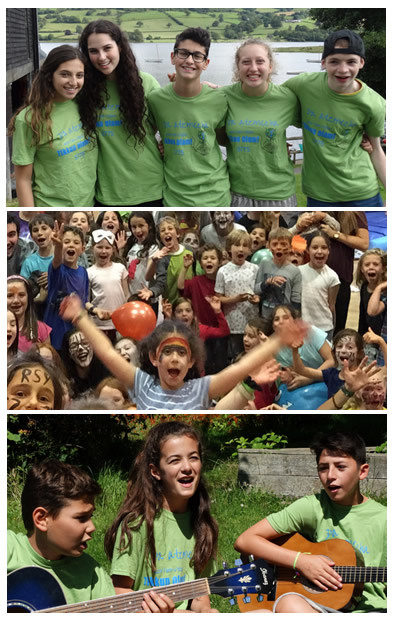 Madrichim (leaders) also spread the RSY-Netzer love in Israel and Canada, experiencing different Jewish summer camps and activities on a global scale! Our theme of the year was Reform Zionism, one of our four ideological pillars. Taking with them their new found knowledge and perspectives of Reform Zionism following Mega Chalutz, our madrichim volunteered their summers to educate our chanichim about the theme in interactive, engaging, and unique ways – from game shows to murder mysteries, board games to space quests, Reform Zionism was made super fun for our participants this summer! Aside from our theme, hundreds of other activities were run for our chanichim by our madrichim. There were kef peulot (fun activities) run every single day, all of which used the imaginations of our chanichim to travel under the sea, into the rabbit hole, through a chocolate factory and many more out of this world places, before returning for bonfires and film nights across our camp sites in England and Wales. We also tackled some serious issues in wider society today – body image, social media, animal welfare, and discrimination to name but a few. Through attacking these issues head on, we were able to come up with productive ways to counter them in society, such as petitions and social media campaigns. All in all, RSY-Netzer’s summer was a resounding success, and one that looks like it will keep its momentum going through to Choref (winter) and Course Hadracha (leadership course)! So thank you to everyone who was involved in making this summer so memorable, and for those who weren’t with us this year… see you in 5777! “When I signed up to Israel tour I was fairly nervous. I knew no one who was going, having never been on an RSY-Netzer tour before. I hadn’t been to Israel before and most of my friends weren’t Jewish. I wondered if I would enjoy it, if I’d make friends and fit in? I needn’t have worried. Israel Tour was a phenomenal experience. The group was extremely welcoming and the unique atmosphere of RSY-Netzer meant I could connect with a wide variety of different people. I personally feel that I’ve made lifelong friends. The UJIA’s provisions also meant that I felt safe and comfortable throughout the visit. The activities on the RSY-Netzer tour are a perfect balance between a fun holiday and an educational and religious trip. Some highlights include visiting Tel Aviv, various markets and of course spending a day at the Kotel. The day spent at the Kotel was superb and unforgettable. Before visiting the Western Wall, we went to the museum within the Kotel. This fascinating exhibition gave me a real sense of the history of Jerusalem. My favourite experience was undoubtedly sleeping out at a Bedouin tent in the Negev. With the stars stretching from horizon to horizon and the complete silence. We also learnt more about the political reality in Israel and the conflict through various seminars and lectures. One example was at Givat Haviva, is centre near the town of Barta’a, a town that straddles the Green Line. The experience of visiting Barta’a allowed me to gain insight into the myriad views about the Israeli-Palestinian conflict. This trip, my first but hopefully not last to Israel, taught me to embrace my Judaism in my own way and enabled me to see how I can become proactive in my community. Israel Tour has altered my perception of Israel and allowed me to develop as a person both spiritually and practically. I know I am certainly more confident now. Furthermore, the tour was extremely educational and I now feel much better equipped to understand and make informed decisions about my faith. I would recommend Israel Tour to anyone. Even if you feel that it is not for you, I am confident you will be surprised by just how much you will enjoy the trip and how much you learn about your identity and faith.